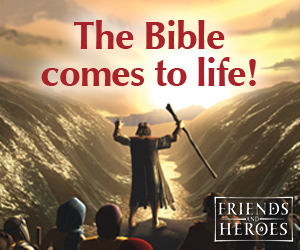 The following crafts and activities come from the Bible lesson "Get the Rocks Out!" 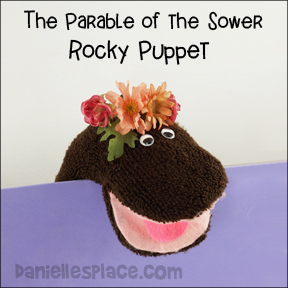 about the Parable of the Sower on The Resource Room. This lesson is presented with a sock puppet that represents dirt. A complete lesson is available to members on The Resource Room. You can find easy directions and a "View it and Do it" craft video on how to make these cheap and easy puppets. 1. Before class print out the flower head pattern and the flower petal pattern onto colorful paper, or use white paper and have the children color the patterns in class. 2. In class have the children cut out the patterns and glue them in order around the flower face. Show them that the petal with the word. Before class prepare two potted flowers. Use clear plastic cups so that the children can see the soil. In one cup place good soil and a healthy plant, fill the other cup up with rocks and just a little bit of soil. Plant a flower, but let it die. In class show the children the two flowers and talk about how the one flower seems to be dying and the other is healthy. Ask them why they think the flower is dying? Bring in cups, potting soil, seeds, and water. Show the children how to sow the seeds. Make sure they know what the word "sow" means. You can also have them decorate their cups with stickers or markers and the Bible verse. You can also add rocks to your potting soil before class and have the children remove the rocks before putting the soil in their cups. 1. Print out the "Be a Doer" cards before class and cut them apart. 2. The object of this game is to be the first person to collect three cards. 3 Tell your students that they will each have a turn to pick a card. They can decide if they want to "be a doer" and do what is on the card, or pass it to the next person. 4. If a child does what is on the card, he gets to keep the card. If he doesn't want to do what is on the card, he can pass it to the next student. If the student who the first child passed it to doesn't want to do what is on the card, that student can also pass it to the next person. It can go all the way around the room until it comes back to the child who picked the card in the first place. If the card goes all the way around, the first child gets to pick another card and decide if he wants to do what is on the card. Once a child has been a "doer", the child next in line gets to pick a card. In class have the children place a few spoonfuls of pudding into their cups and then stir in two spoonfuls of crushed Oreo cookies. They can also add a gummy worm to the top. Enjoy. 1. Before class print out the flower patterns onto colorful paper. Use different colors for the middle of the flower. 2. Cut out the flower head and petals and place them in plastic bags. 3. Show the children the petals and explain that this project will help them to remember to be "doers". When they do something that is written on one of the petals, they can tape that petal onto the flower head. Tell them to try and do what is written on each petal this week to complete the flower. Every time you say "Itty-bitty seed" make your voice real squeaky like a mouse's. Every time you say "Great big seeds" make your voice go real deep. Great big seeds - make your arms a circle out in front of you.